An investigation is still ongoing into the Tubbs fire, the largest of last year’s deadly blazes. California fire investigators have blamed Pacific Gas & Electric for failing to clear trees and brush from around power lines that sparked eight wildfires that tore through Northern California last fall, adding to the list of potential financial liabilities threatening the utility. Friday’s report from the California Department of Forestry and Fire Protection (Cal Fire) assigns blame to PG&E for some of the wildfires that devastated Northern California's wine country last year, killing 44 people and leading to more than $3 billion in insured property losses. But it did not include any findings on the Tubbs fire, the largest of last year’s deadly blazes, which killed 22 people and destroyed more than 4,000 homes in Santa Rosa and greater Sonoma County. The report investigated 12 fires, and determined that all were caused by PG&E equipment, largely by trees being blown into power lines during the windstorms late at night on Oct. 8, which caused the biggest of the blazes. Of those, Cal Fire referred investigations to the appropriate county District Attorney’s offices for review in eight of the 12 fires — Sulphur, Blue, Norrbom, Partrick, Pythian, Adobe, Pocket and Atlas — “due to evidence of alleged violations of state law” for failing to clear brush around its lines and properly maintain its power equipment. The Atlas Fire in Napa County and the Pocket Fire in Sonoma County burned an additional 68,981 acres, destroyed 789 structures and killed six people, and were determined to have been caused by trees falling onto PG&E power lines, Cal Fire stated. 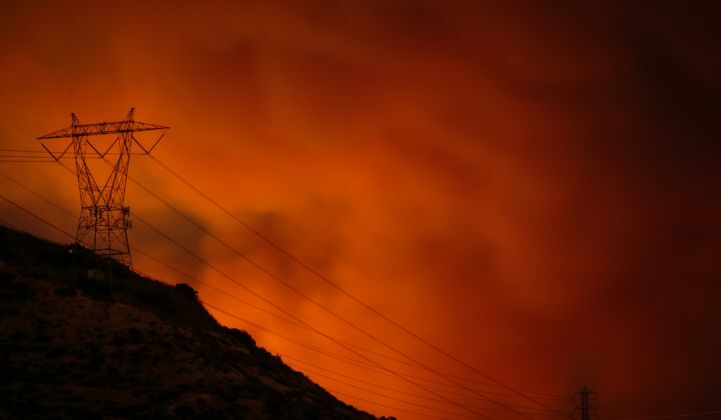 This is the second investigation to back up widely reported claims that PG&E’s poor maintenance and management of its power lines, combined with high winds and dry vegetation, sparked some of the more than 170 wildfires reported across the state in October. Late last month, Cal Fire found PG&E negligent in its vegetation management duties for three of four fires it had investigated in the Sierra Nevada foothills, which caused no fatalities. The new report accuses PG&E of violations of state law for a much larger set of blazes involving far larger losses of property and life. PG&E has lost more than $14 billion in market valuation since the state investigations were first reported in November, with wild swings in share price following each new finding — or rumored finding — in the investigation. PG&E shares fell from $41.45 at Friday’s close to $38.38 at the opening of Monday trading, and were trading at less than $40 as of midday. PG&E faces hundreds of lawsuits on behalf of residents burned out by the fires in its territory, as well as lawsuits from the counties of Sonoma, Lake, Mendocino and Napa. The Santa Rosa Press Democrat, which has been leading local coverage of the investigations and their legal ramifications, noted in its Friday reporting that PG&E has about $800 million in liability insurance. Insurance claims from the fires now total nearly $10 billion — although it’s important to note that a large share of that total comes from the Tubbs fire. PG&E responded to Friday's report in a statement noting that it prunes or removes about 1.4 million trees per year, and meets or exceeds state requirements for managing patrols and inspections of its more than 2 million power poles. Since 2014 it has increased daily aerial fire detection patrols during high fire season, added foot and aerial patrols of power lines in high fire-risk areas, and removed “hundreds of thousands of dead or dying trees” weakened by drought and bark beetle infestations, it added. The utility is also working with California Gov. Jerry Brown and state lawmakers to create a legislative remedy to a legal principle known as “inverse condemnation," which holds that utilities are liable for damages even if they violated no laws. California’s unusual application of this principle to “events associated with utility-owned equipment” could open PG&E and the state’s other investor-owned utilities to much greater legal liabilities, with negative implications for their share prices and ability to raise debt. Bloomberg also reported that a plan for a compensation fund to help cover utilities’ liability exposure and compensate victims “may not come together,” according to unnamed people involved in the discussions. Efforts like these will likely face a significant challenge in covering the higher end of PG&E’s potential liabilities without raising rates for customers, however. Rebuild With Resilience, a coalition of insurance companies, issued a statement on Friday asking lawmakers to find a solution that doesn’t increase utility rates to cover its costs. Meanwhile, the Santa Rosa Press Democrat quoted John Fiske, a lawyer representing burned-out residents and Sonoma, Napa and Mendocino counties in their litigation against PG&E, as saying that his plaintiffs intend to prove PG&E was negligent even in cases where Cal Fire found no state code violation. “Just because they’re not in violation of a statute doesn’t mean they weren’t negligent,” Fiske said, arguing the utility company should have maintained its equipment and developed sufficient plans for protecting against fires during predicted windstorm events.